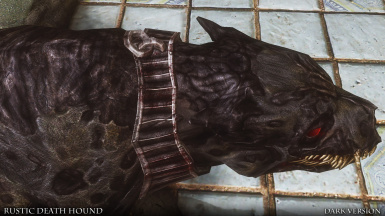 High resolution retexture of the Death Hound from the Dawnguard DLC. 4K and 2K resolutions available. 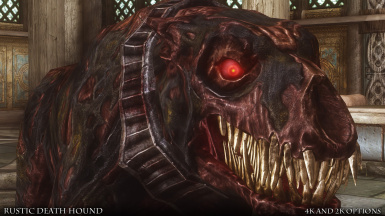 Bethesda for allowing mod authors to modify their wonderful game. Textures.com for being an invaluable photographic resource. 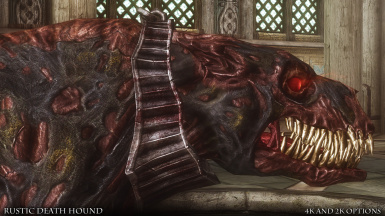 Added 2K-1K version for people who wanted a less VRAM consuming version. The diffuse texture is saved in DXT1A compression which gives a more jagged mask to the teeth, but cuts the file size in half. 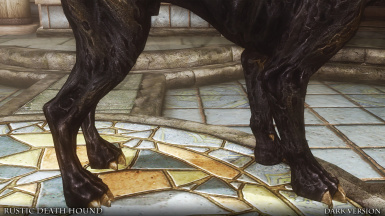 A good compromise for people who want the detail of a 2K color texture, but still want to save on VRAM. 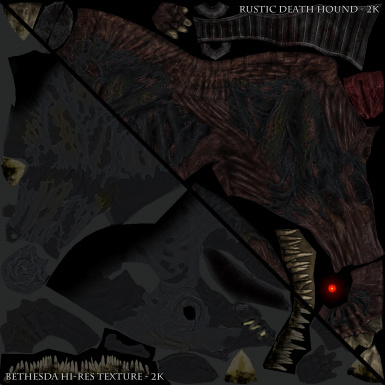 RUSTIC DEATH HOUND is a hi-res retexture of the Death Hound (AKA Vampire Dog) from the Dawnguard DLC. 4K and 2K resolutions available. UPDATE - 7/29/16: Added Dark Version for people who wanted the original grey color scheme. UPDATE - 7/28/16: Added 2K-1K version for people who wanted a less VRAM consuming version. The diffuse texture is saved in DXT1A compression which gives a more jagged mask to the teeth, but cuts the file size in half. 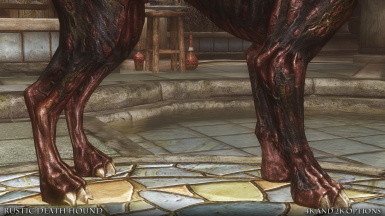 A good compromise for people who want the detail of a 2K color texture, but still want to save on VRAM. 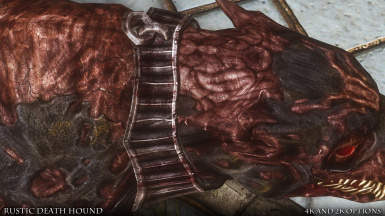 As many know, I've been working on the Dawnguard clothing for my RUSTIC CLOTHING mod. 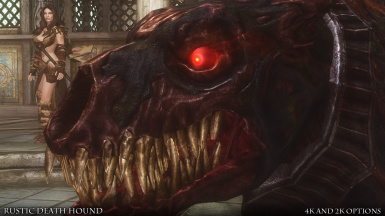 While in the process, I took a peak in the actors folder, and looked at the "Vampiredog" folder. What I found was a bit of a shock. 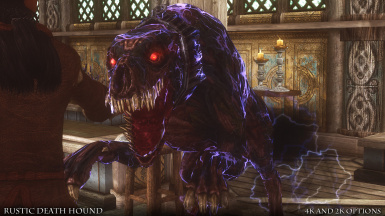 I knew the Death Hounds looked rather sad in game, but the rudimentary execution of the textures still came as a surprise. I must've blocked them out from memory to prevent permanent psychological damage. OK, I thought, the vanilla ones are bad, but surely the hi-res texture pack ones must look better..... Nope. What I found were a 2K mess. 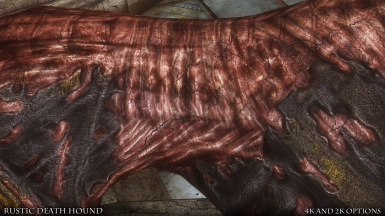 The diffuse body texture was basically two shades of grey with a noise filter applied to them. 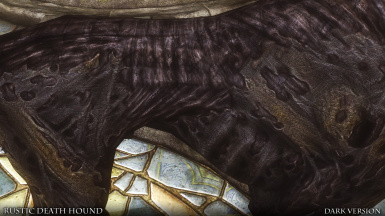 To say that these textures were lazy in their execution would be a kindness. What is particularly disappointing, is that the original design and model are pretty good. 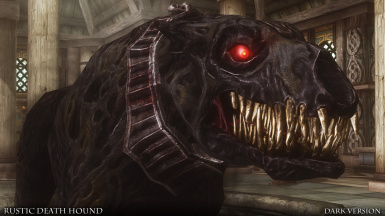 The Death Hound had the potential to look so much better than what that particular Bethesda texture artist came up with. The concept of the Death Hounds is frightening... A mutated undead hound with rotting flesh, glowing eyes, and a cloak of black mist surrounding it. 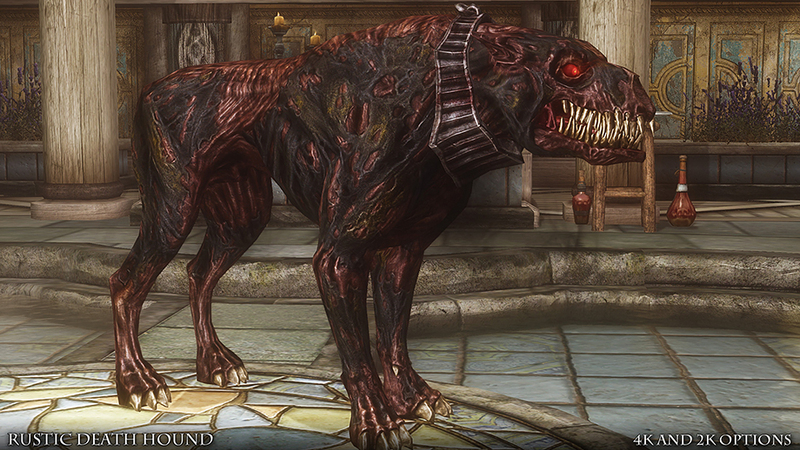 I wanted to redo the textures to give the Death Hounds a truly scary and unsettling appearance. 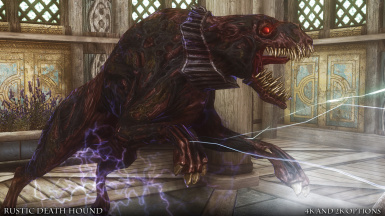 The people of Skyrim should fear the sight of a Death Hound. 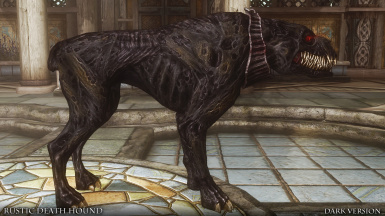 So, I took a little break from making clothing, and endeavored to make a properly ghoulish vampire companion. I hope people like the results of my efforts.